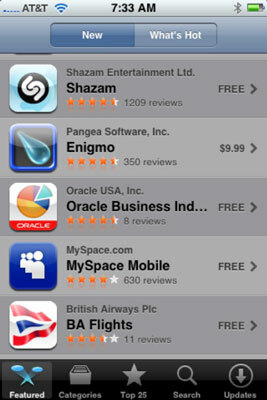 You can search the iTunes App Store directly from your iPhone. The first three icons at the bottom of your iPhone screen — Featured, Categories, and Top 25 — offer three ways to browse the virtual shelves of the App Store. The Featured section has two tabs at the top of the screen: New and What’s Hot. These two tabs represent two different pages full of apps. Tap the New or What’s Hot tab to find the latest apps. The Top 25 section works the same way. Its two tabs — Top Paid and Top Free — represent pages of popular apps that either cost money (paid) or don’t (free). Each page displays roughly 20 to 25 apps, but you see only four or five at a time on the screen. So remember to flick up or down if you want to see the others. The Categories section works a little bit differently. It has no tabs and its main page contains no apps. Instead it offers a list of categories such as Books, Games, Lifestyle, Utilities, and so on. Tap a category to see a page full of apps of that type.